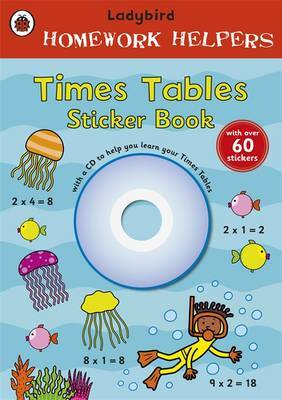 A useful homework helper book from Ladybird: Times Table Sticker Book with CD. You can help your child to learn, remember and practise their times tables with the Ladybird Times Tables Homework Helper. This bright, interactive activity book is in line with the government's Primary National Strategy, containing the times tables from 1-12 in the order that children learn them in school. Each page has a range of fun, motivational times table activities to complete and there are also over 60 colourful stickers to reinforce learning in an entertaining way. The attached CD contains twelve bouncy songs to sing along to, with the times tables from 2-12 and a times tables medley. Listen to the songs alongside the book or on their own for extra practise and sing or say the times table answers each time. It's never been more fun to learn the times tables with Ladybird! Also Available: Homework Helpers Wipe Clean Handwriting Book Ladybird publishes the very best books for babies and toddlers - colourful and engaging, they encourage early interaction with books and the wider world. Watch your little one have fun and learn with Ladybird from their very first book until they start school. Look out for the classic Ladybird series - there is a Ladybird book for every age and every stage. Baby Touch; Toddler Touch; Busy; First Favourite Tales; Read It Yourself; Topsy and Tim; and Key Words With Peter and Jane.